Stop wondering where to buy Freezer Paper because you have arrived. Look no further than our custom printed Freezer Paper. It protects food in the freezer for up to 1 year! Our Freezer Paper sheet is strong enough to protect your food in the coldest of food storage conditions? A great selection for commercial freezer paper! This heavyweight freezer wrap paper sheet has a thick poly coating that helps protect against freezer burn and keeps your wrapped meats and fish fresh. Custom printed Freezer Paper is the strongest food service sheet on the market today! What is the minimum order requirement for custom printed Freezer Paper? 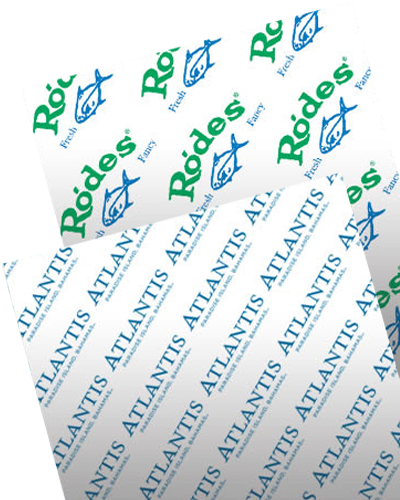 Custom printed Freezer Paper has a 3 case = 3,000 sheets (1,000 sheets per case), OR 5 rolls = 4,500 feet (900 feet per roll) minimum. Storage space is not an issue with short runs like this! What is the lead time for custom printed Freezer Paper orders? Standard lead times for all custom printed Freezer Paper orders is 6-8 weeks. Rush orders are available for an additional fee when the production schedule allows. Transit time is typically 2-4 days for the East coast, and 5-7 days for the West coast. Am I restricted to a small list of standard Freezer Paper sheet sizes? No! While we do offer a list of standard Freezer Paper sheet sizes to help keep your overall project costs down, we can also custom cut your sheet size to any desired width and length needed to fit your application. If you have more than one shade of a specific PMS color in your logo then YES! We have the ability to add 1 or 2 screens to your print if the colors in your logo allows for it. Our talented design team will provide all the help necessary to solve any artwork challenge. 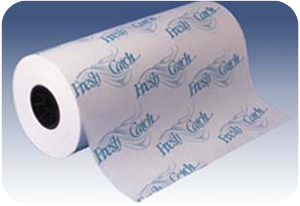 Need a price quote on custom printed Freezer Paper? Contact us today! Looking for a unique food service sheet unlike all the rest? Then check out our custom printed Golden Rod Paper. Your brand will feel like it has hit the gold mine when you print your logo on this unique food service sheet!